Good Witch on Hallmark Channel: Cancelled or Renewed for Season Five? Has the spell been broken? Is the Good Witch TV show cancelled or renewed for a fifth season on Hallmark Channel? The television vulture is watching all the latest cancellation and renewal news, so this page is the place to track the status of Good Witch, season five. Bookmark it, or subscribe for the latest updates. Remember, the television vulture is watching your shows. Are you? A Hallmark fantasy dramedy, Good Witch stars Catherine Bell, Bailee Madison, James Denton, Rhys Matthew Bond, Sarah Power, Catherine Disher, and Kylee Evans. The story unfolds in the town of Middleton and centers on Cassandra “Cassie” Nightingale (Bell) and her teen daughter, Grace (Madison). The two share a special intuition and are enchanting in more ways than one. In the fourth season, while Cassie and Sam (Denton) are planning their nuptials, Grace and Nick (Bond) try to repair their friendship, before their families are blended. Cassie continues to bring her magical touch to her nearest and dearest and to the guests at Grey House, as well. The fourth season of Good Witch averaged a 0.23 rating in the 18-49 demographic with 2.14 million viewers. Compared to season three, that’s down by 4% in the demo and even in viewers. Learn how Good Witch stacks up against other Hallmark Channel TV shows. Good Witch has been renewed for a fifth season with a start date TBD. Stay tuned for further updates. 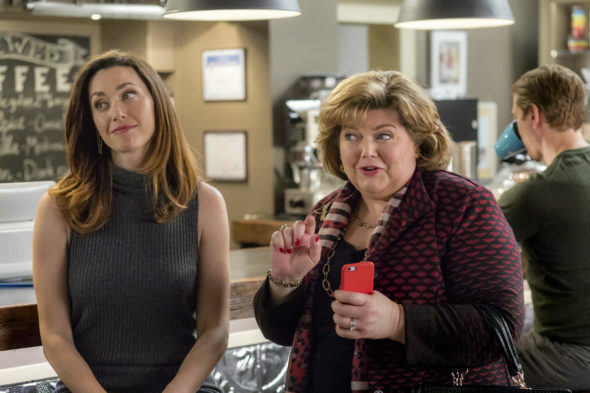 Will Hallmark cancel or renew Good Witch for season five? The ratings are very good so I suspect that a fifth season renewal is in this show’s future. I’ll update this page with breaking developments. Subscribe for free alerts on Good Witch cancellation or renewal news. 7/6/18 update: Hallmark has reportedly renewed Good Witch for a fifth season. TV show ratings are still important. Follow Good Witch‘s weekly ups and downs. Check the rankings for Hallmark Channel’s other scripted TV shows. Find more Good Witch TV series news or other Hallmark Channel TV show news. What do you think? Are you glad that the Good Witch TV show has been renewed for a fifth season? How would you feel if Hallmark Channel had cancelled this TV series, instead? More about: Good Witch, Good Witch: canceled or renewed?, Good Witch: ratings, Hallmark Channel TV shows: canceled or renewed? Good Witch: Is the Hallmark TV Show Cancelled or Renewed for Season Six? Good Witch: Cancelled or Renewed for Season Four by Hallmark Channel? I love this show and so pleased it’s coming back for season 5. I watch the first 4 season over and over when I need something to take the stress out of life. Season. It is my favorite show on TV currently. I thoroughly enjoyed the movie and the first four seasons of The Good Witch. It is a wholesome captivating show, with very winsome characters. I can’t wait for season five to yir. I enjoyed watching each season of The Good Witch. I didn’t think I would like it but it was very good. Waiting for season 5. If this helps, I am 64…. I love this programme I watch it with my daughter it’s awesome. I like that it can relate to some teenagers and Shows a positive way to deal with situations while adding some magic to it. Its modern but still holds some traditional old fashion values. It’s a fantastic series please don’t cancel this if nsic can go on for 11 seasons so can this.